Louis James Fraser was a controversial, solitary figure, who set up camp on one of the seven hills' cool, lush summits. The area became known as Fraser's Hill. The Scottish pioneer and opium-den operator disappeared under mysterious circumstances before the area's potential as a hill station was recognised. Others followed him and investigated the site, ultimately finding it perfect for a highland retreat. The area lies in the state of Pahang and is north of the Genting Highlands. Situated around 5,000 feet (1,524m) above sea level, it is the only hill station within two hours' drive of Kuala Lumpur. Nature lovers and bird enthusiasts will enjoy the cool, serene region. 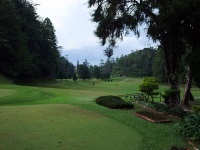 Jungle trails, waterfalls and colourful nurseries nestle peacefully in the landscape, complementing golf courses and horse-riding routes. Visitors will also find extensive hiking trails. Regarding accommodation, travellers can choose from a range of chalets, hotels, and colonial bungalows.